In addition to the payment of medical expenses and wages based on a set formula, additional employee compensation for injuries is covered under the Workers Compensation Act. An employee may be entitled to an award for the total permanent disability percentage of the injured body part, ranging from a small finger injury to an accident resulting in the death of the employee. An award for a certain amount of weeks is recovered based on the severity of the disability, body part injured and the employee’s salary at the time of occurrence. Other Workers Compensation benefits can include vocational rehabilitation, reinstatement to a previous employment position, and reassignment to appropriate employment duties. 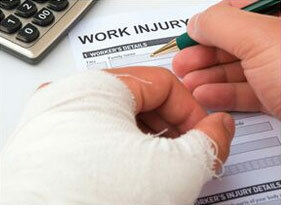 It is very important to seek the advice of an experienced Workers Compensation attorney if you are injured at work. There may also be third party claims involved in an accident such as product liability and/or the negligence of contributing parties. It is important to always remember that your employer is prohibited by law from retaliating against you for filing a Workers Compensation claim. Report Regardless of how serious your injury may be, report your accident. Keep record of anyone you speak to regarding your incident. Medical Attention Generally, you have the choice of any physician you want to see, or anyone that physician refers you. It still only counts as one choice. Emergency rooms and company clinics do not count as your choice of physician. If your company directs you to go to a company or occupational clinic then you may go, but you still have the choice of your own physician regardless of what the occupational or company clinic prescribes for you. Unable to Work If you are unable to work, provide your company with documentation from your doctor stating you are unable to work. On your doctor’s report you are then entitled to temporary total disability benefits to cover any pay you miss while you are unable to work. Work with Restrictions If you are able to work with restrictions, provide these restrictions to your company, and your company must either accommodate these restrictions, or pay you to remain off work until such time as you are able to return to work full duty. Settlement Award Once you complete all of your medical treatment, and you are able to return to work earning what you earned prior to your injury, you will be entitled to a settlement or trial award for your injuries. Unable to Return to Work If you cannot return to work then your company has to assist you in finding alternative employment. If you earn less than what you earned before your injury, you are entitled to 2/3 the difference between what you could have earned before your injury, and your reduced income due to your work injury. Unable to Work at Any Employment If you cannot return to any type of employment, your company must pay you 2/3 your pre-injury salary tax free for life. Legal Representation You are entitled to legal representation. Having an attorney on your side protects your rights and is your best opportunity for maximum recovery. Contact our office as soon as possible after your accident, so we may initiate a claim on your behalf through your company’s workers compensation insurance carrier. Please click on these links for detailed information regarding Car Accidents, Medical Malpractice, Nursing Home Neglect & Abuse and Products Liability.